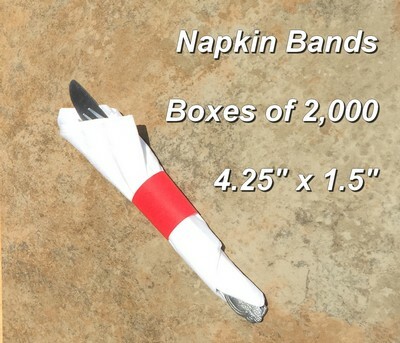 Order boxes of 2,000 napkin bands to wrap silverware and flatware when using paper napkins. Pegasus Ventures brand napkin bands/straps in boxes of 2,000 work great for family events and, most often, we find folks buying our boxes of napkin bands for weddings. Pegasus Ventures keeps the all colors of the box napkin bands in stock ready to ship! White restaurant napkin bands to wrap with paper napkins- 2,000 1.5" x 4.25"